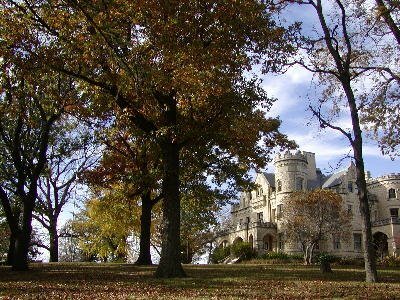 This blog will provide a vitural walk to all the stops on the 2005 walking tour published by the Joslyn Castle Neighborhood Association. The brochure was made possible through the work of a CLG(Certified Local Government)Grant administered by our City of Omaha Planning Department and funded by the U.S.Department of the Interior, National Park Service. I also want to thank the many neighborhood volunteers who took up this task of researching and publishing our history. 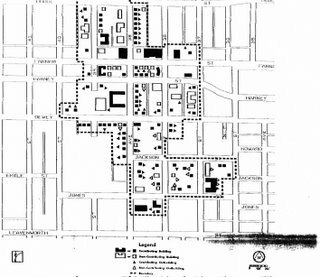 In the late 1800's Omaha began to expand its boundaries to the outer edges of 40th street as the population of Omaha exploded from 30,000 in 1880 to 140,000 in 1890. Real estate brokerages and building companies sprang up and struggled to keep up with housing demand. 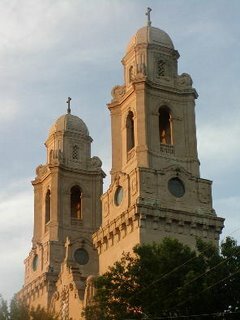 The construction of George Joslyn's 'castle' and begining of the St. Cecilia's Cathedral in the early 1900's ensured that this new area in Omaha was the place to live. 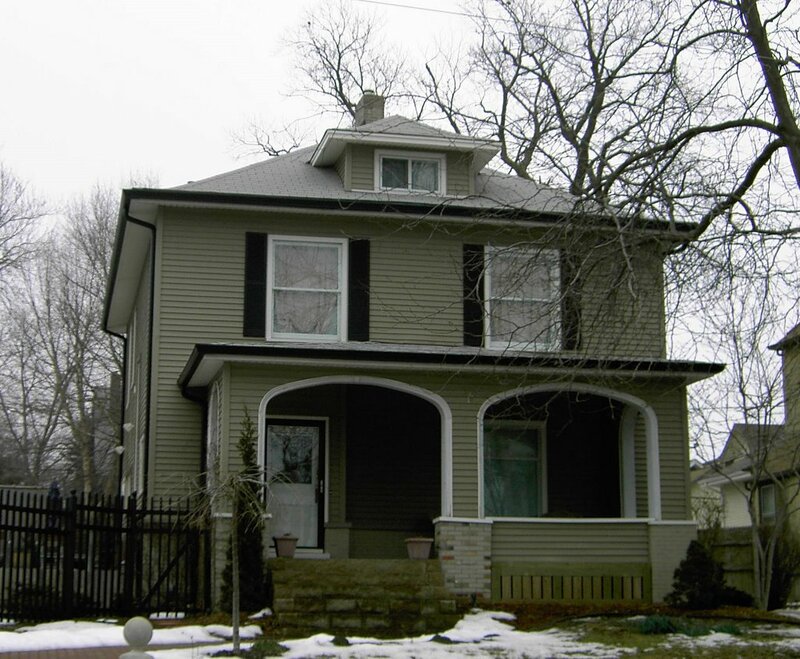 From Farnam to Hamilton, 40th Street became a vibrant area with shopping districts at every major intersection, three churches, a community play house and many of Omaha's prominent citizens living along the corridor. From the early 1900's through the mid-1930's, public transportation(the Omaha streetcars) helped spur additional development in this area and beyond, to the neighboring villages of Dundee and Benson. The trolley service provided easy access to downtown and even to the far north edges of Omaha, where a favorite Sunday outing might include a ride to the end of the trolley line and a walk to Dodge Park for a picnic. At the lower center portion of this copy of a historic street map, you can see the Stuphan property that became the location of George and Sara Joslyn's home. Also note 40th street is named Lowe Ave. This is where I am going to start the virtual tour of 40th street. This intersection is very significant because this was the major commercial and transportation hub at the south end of our 40th street. Not only was there a thriving business district with the north west corner anchored (no pun intended) by the Admiral Theater. Fortieth street between Farnam and Dodge streets was also a two block stretch of the coast to coast Lincoln Highway. 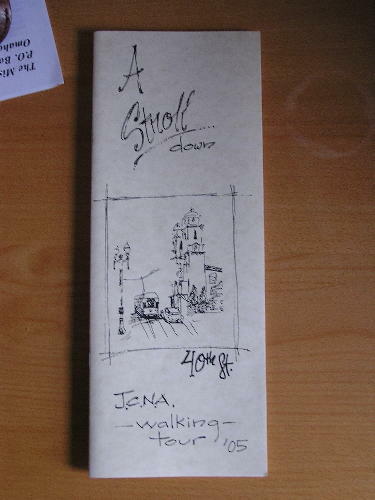 Not to forget to mention a vital route on Omaha's street car system. 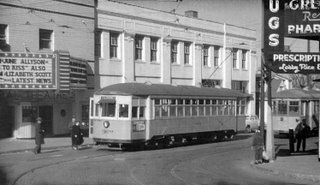 These street cars had just arrived from Dundee in the above photo and where picking up passengers before heading east on Farnam street towards downtown. 2nd Church of Christ, Scientist at 41 and Davenport St. Struck bylighting and burned to the ground July 31st, 1963. 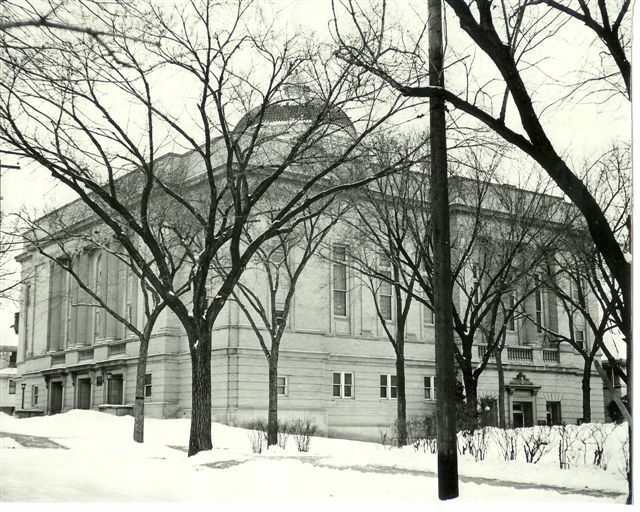 Founded in 1924 by Alan McDonald, the Community Playhouse spent its first two years hosting productions in a variety of locations, including its first show a Technical High School Auditorium in March 1925. 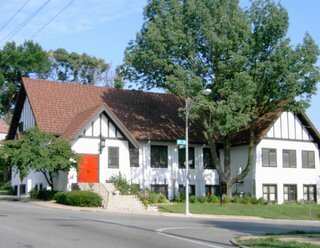 One month later the new Community Playhouse presented “The Enchanted Cottage” on the stage at Mary Cooper Dance Studio at 40th and Farnam. In 1928, the playhouse lost one of its venues when the Cooper Dance Studio was converted into a chicken diner house. Under the guidance of Mrs. Genevieve and Alan McDonald, design drawings for a new playhouse had already been drafted by Alan and his father, architect John McDonald. While raising money for a permanent performing arts building, Mrs. Guiou made arrangements with Mrs. Joslyn to build a temporary structure on land referred to as Sarah’s “cow pasture.” Constructed in October 1928, the simply designed playhouse was built in 28 days. Opening night was October 30, with the audience standing outside while the last of the seats were bolted down and debris swept away for the performance of “Aren’t We All”. Space was, to say the least, limited at the playhouse, with only a single exit off the stage. When an actor had to re-enter a scene on the other side of the stage, quite a commotion was created by the neighborhood dogs as the actor left the building and ran around the back to enter again at the other side of the building. Storage for costumes and props was provided across the street in the Joslyn’s carriage house. A leaky roof in the carriage house would soak the costumes, making it necessary to lay them out to dry all along Sara’s yard. 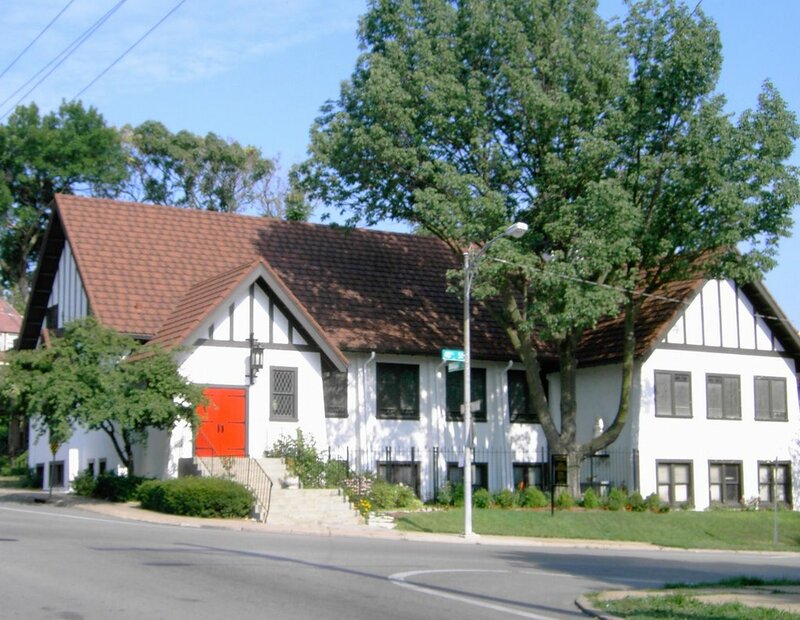 With public support from the Omaha community, the funds were finally secured and the new Omaha Community Playhouse was built at 69th & Cass Streets. The old playhouse was torn down a few years later. More information can be found on the Playhouse’s Website. 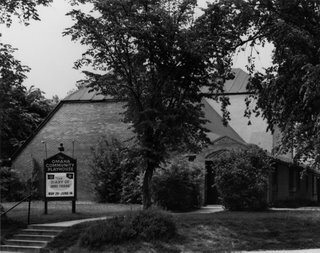 Boggers Notes; The original Omaha Community Playhouse at 40th and Davenport Street is now the site of the Cathedral Apartments. In January 1869, a local parish priest designed the first St. Barnabas Church in Omaha. Located at 9th and Douglas streets, it was a 20' x 36' structure that cost under $1,200 to build. February 7, 1869, marked its first service, and by July of the same year the structure was relocated to 14th and Cass streets. In early July 1870 the congregation again moved their church, this time to 19th and California streets, but on July 13 a tornado tore the church from its foundation. Five days later the congregation broke ground for a new building on the same site. 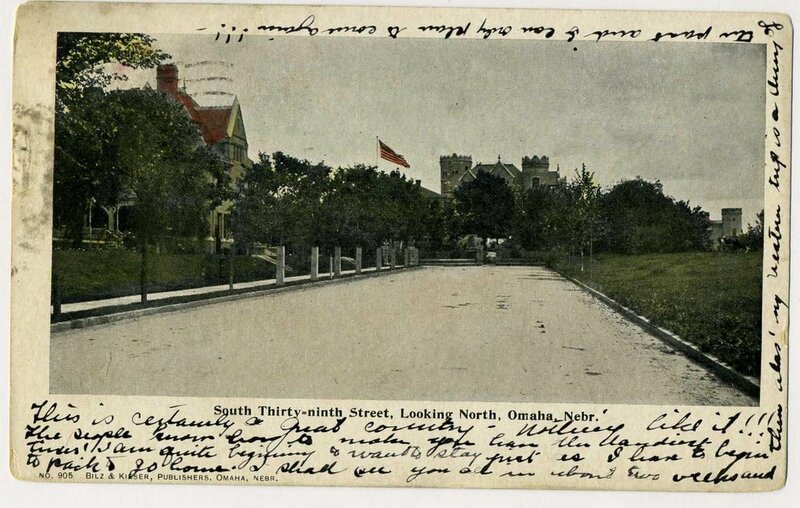 Following the Easter Sunday tornado of 1913, St. Barnabas purchased the land across from the Joslyn home for $7,000. 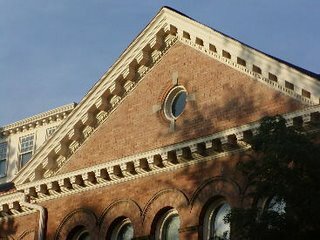 The Reverend Lloyd D. Hosapple, a native of Herford, England, arrived in 1914 and influenced Charles M. Nye's design from the new church, basing it upon a Hereford parish church complete with wood timber and stucco construction. St. Barnabas features many important appointments in the interior. One is a relief of the Virgin and Child, cast from the original Luca della Robbia mold of the 15th century. Wood carvings in St. Barnabas were hand made in Oberammergau, Germany. The church's nave is home to the most extensive collection of ecclesiastical art glass by C.E. Kemp in the country. The four windows at the Epistle of the altar were made by Ernest Lakeman and installed in 1935. 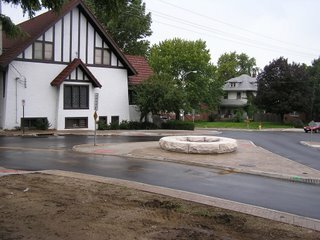 This pedestrian plaza was completed in October 2006 by a partnership between the Joslyn Castle Neighborhood and the city of Omaha Public Works dept. It took two and a half years to execute this traffic calming plaza idea and included a collaboration of many local neighborhood interests. The focal point of the plaza is the chipped limestone planter that is currently planted with grasses and other low maintenance plants. 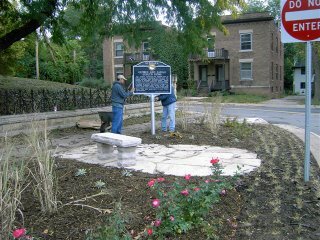 The green space around the historical marker for the Sara and George Joslyn home also includes low maintenance plants and buffalo grass. The vegetation for this civic space was partially funded by the Nebraska Statewide Arboretum. Bloggers Notes; The National Register Landmark Nomination describes this house as "Scottish Baronial" which in not a period of architecture but a style of the Victorian movement. I think it may have been the best guess at the time the National Register nomination was written because there was little understanding of the Art & Crafts periods that were flurishing post 1900. 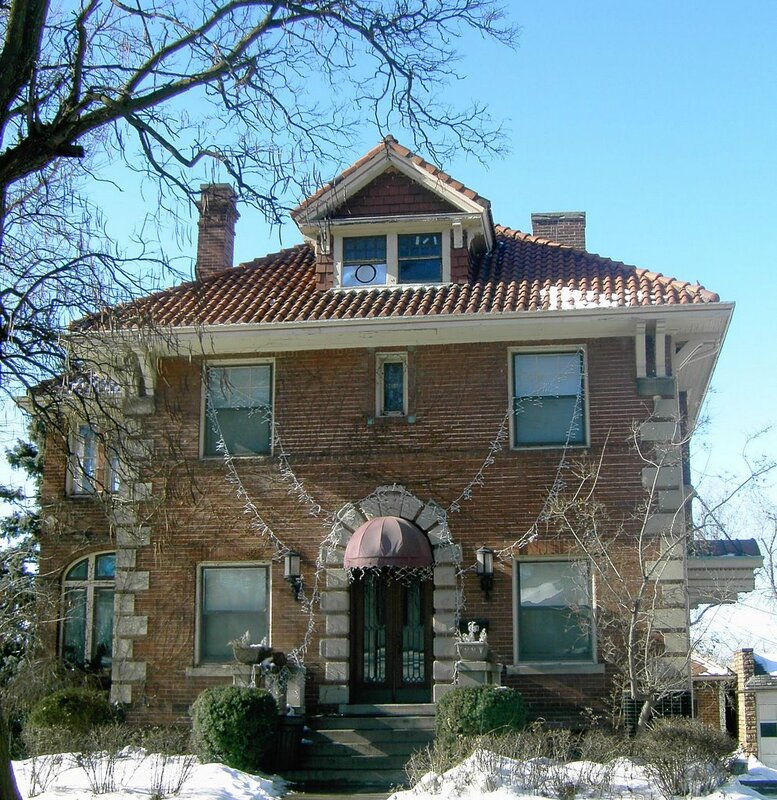 The Nebraska Historical Society helped define the mansion for the Nebraska Historical Society Marker as a high style of (Arts & Crafts, Tudor Revival) manor house. If you interpret the entire property and all its design elements (not just the exterior of the buildings) the conclusion would be Arts & Crafts- Tudor Revival in a Scottish manor house style. Bungalow Magazine had a recent issue on several Scottish Manor houses that were built in the same period, reviving the notion of a (perhaps idealized) pre-industrialized era. The interior of the home is filled with tudor revival design elements with Scottish Rose & thisle(an Arts & Crafts motif) along with other Arts & Crafts themes including very simple but beautiful wood work. Keep in mind the Arts & Crafts movement was an design movement rebelling against the Victorian-Industrial Revolution(mass production) movement. The Arts & Crafts movement elevated the status of hand crafted products above manufactured products. The Arts & Craft movement began before 1900 and floushished from about 1890 to 1920s. The Joslyn house was build in 1903. The landscape is not part of the Nation Register Nomination but is historically significant none the less. The grounds resembled the naturalist form of landscaping popular after the Chicago Worlds Fair , Fredrick Law Olmstead (designer of Central Park) and during the Arts & Crafts movement. The only formal flower beds on the property were located between the front gate and the entrance to the house. In 2004, under the auspices of the Joslyn Castle Neighborhood Association, $13,000 was raised by writing multiple grants in order to replentish some of the missing vegetation. In 2005, after 3 years of planning, 34 trees were replanted along with shrubs and bushes in an attempt to restore some of the lush landscaping that once existed. The term 'Joslyn's Castle' was coined by a local newspaper. Mr. Joslyn did not like the term and wanted the home referred to as Lynhurst. 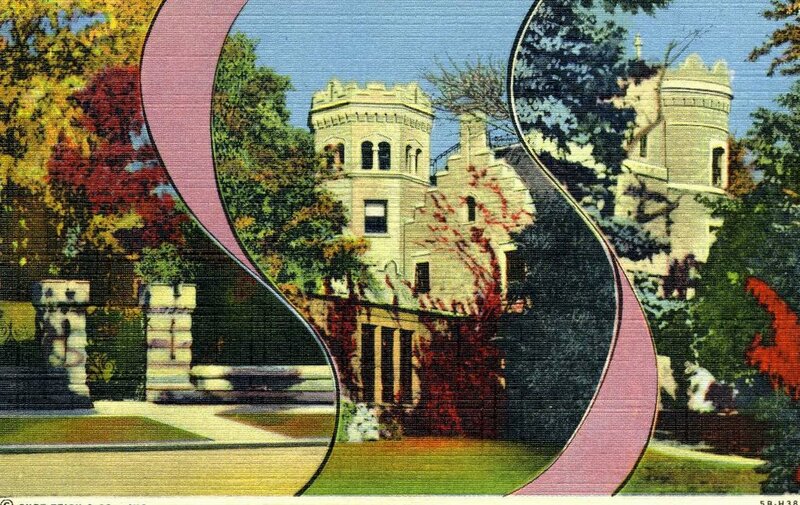 Joslyn's Castle was by no means the first home in referredefered to as a "castle". 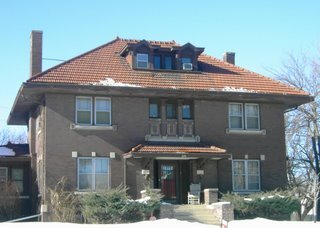 The 'Yates Castle', at 32nd Avenue and Davenport, was the first home in Omaha dubbed a Castle according to local newspapers. The Yates Grade School and Hill Side Court apartments now occupy the location of the once grand Yate's home. 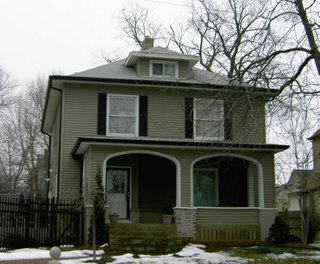 In the early 1920’s Edward Peterson moved into this house and lived there until the late 1930’s. He was a senior partner in the “heavy contracting” firm of Peterson, Shirley and Gunther. He built the first racetrack at what came to be know as the Aksarben Racetrack in the 1890’s. When the track was rebuilt in 1919 his firm was contracted again to do the work. He was a well-known owner of harness and racing horses and raced many of his horses at Ak-Sar-Ben. His great-granddaughter Jun remembers her grandmother telling stories about their neighbors, the Carl Swanson family. Mrs. Swanson used to can soup and send her boys door to door selling it. Later the Swansons started the Swanson & Sons company, and thus began the famous food production business. Within a year of each other, both the Petersons and the Swanson’s moved to the Dundee neighborhood and once again became next-door neighbors. 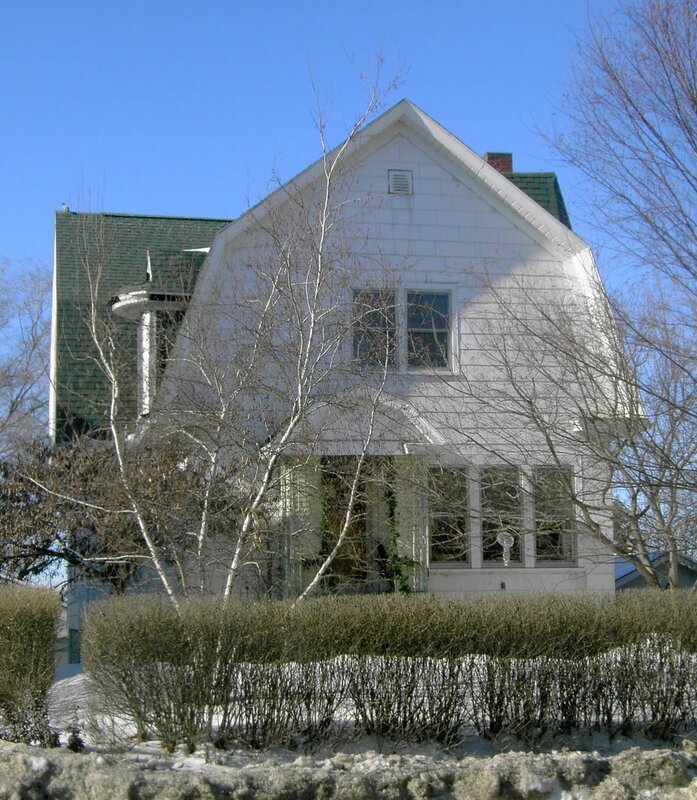 In 1920, Carl and Caroline Swanson bought this house and lived with their three children. Carl Swanson had come to American from Sweden in 1896 at the age of 17. It is reported that he came with a sign around his neck that said, “Carl Swanson, Swedish. Send me to Omaha. I speak no English.” In 1899 Carl Swanson became a partne with John Hjerpe in a commission business hauling eggs, mil and poultry they bought form the farmers and selling them to the grocery stores and hotels in Omaha. In the beginning they had one wagon, a horse and one delivery boy to run the business. They hired someone to paint their company name on the wagon. The “artist” misspelled the name, and Jerpe Commission Company was adopted by the partners because funds were tight and they could not afford to have the wagon re-painted. This name lasted 45 years until the company name was changed to C.A. Swanson & Sons. After Carl Swanson died in 1949, his two sons took over the company. His sons pushed into the arean of frozen prepared food, and in 1953 the first Swanson “TV dinner” was sold. The dinner was a slice of turkey, dressing, gravy, sweet potatoes and peas, and sold for 98 cents. It was marketed to the busy housewife. Bloggers Note; Notice the muted green square tile used in the chimney. It is repeted often in Arts & Crafts period buildings throughout the neighborhood. Fred and Kate Sanborn built this house and lived here until 1907. Mr. Sanborn came to Omaha in the late 1880’s to seek his fortune. He began the F.E. Sanborn Company, manufacturers of “Standard Horse & Cattle Food,” and in the first year was the sole member of his company, serving as both stock boy and president. By 1892 the company employed 30 people, producing nearly 2 million pounds of feed sold in 18 states. 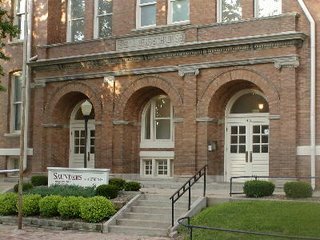 Sanborn acquired two partners in his business, one being T.C. Havens, owner of a prosperous coal company. Havens was also a neighbor, living at 101 No. 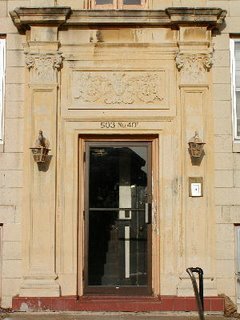 39th Street in what is now the individually landmarked historic Havens Mansion (made entirely of concrete). Sanborn later was president of the Standard Chemical Manufacturing Company, president of Omaha Manufacturing Association, and president and original promoter of the Omaha Auditorium Commission. This house was designed by the architectural firm of Fisher & Lawrie. This firm evolved from the firm of Mendelssohn, Fisher & Lawrie founded in 1880’s. Fisher & Lawrie’ partnership continued until 1913. 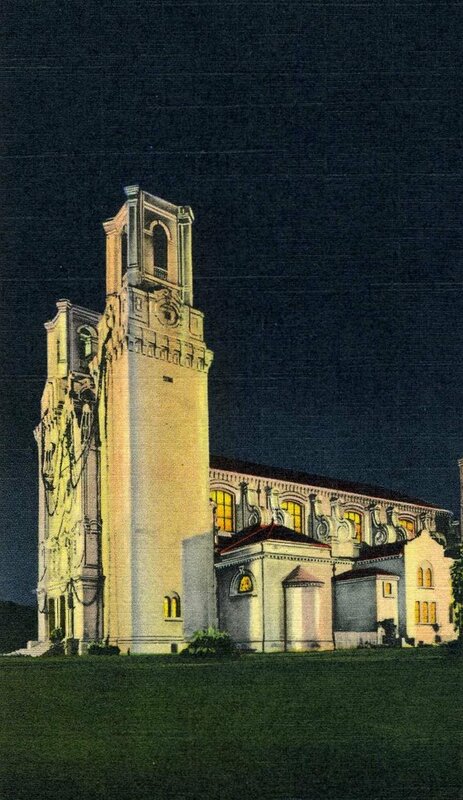 Some of the other buildings they designed were the Gottlieb Storz house and the Sacred Heart Church. George Logan owned this lot and the lot directly north prior to 1887 when he deeded both lots to John Evans. In 1888, the year the house was built, other names appear on the deed – Martin Marshall, John McCullough, Lon Payne and Richard Mitchell. These names are presumed to be connected to the Mutual Investment Company. The name of the owners appears building permits for both the 362 and 366 lots. Not much is known about his company, but the Omaha Bee carried many advertisements for the sale of lots in 1887 and 1888. Many companies offered free carriage rides out to view the lots for sale. At the start of the New Year, the Omaha Bee would do a summary of new businesses started in the past year. In 1887 and 1888 many housing investment companies and builder’s associations were formed to accommodate the real estate boom in Omaha. These two houses are the second oldest houses built facing 40th street between Dodge and Cuming streets. According to Alfred Sorenson in History of Omaha, Omaha’s population grew substantially in the 1880’s. In 1880 Omaha had 30,000 people and by 1889 the population was estimated at 120,000. 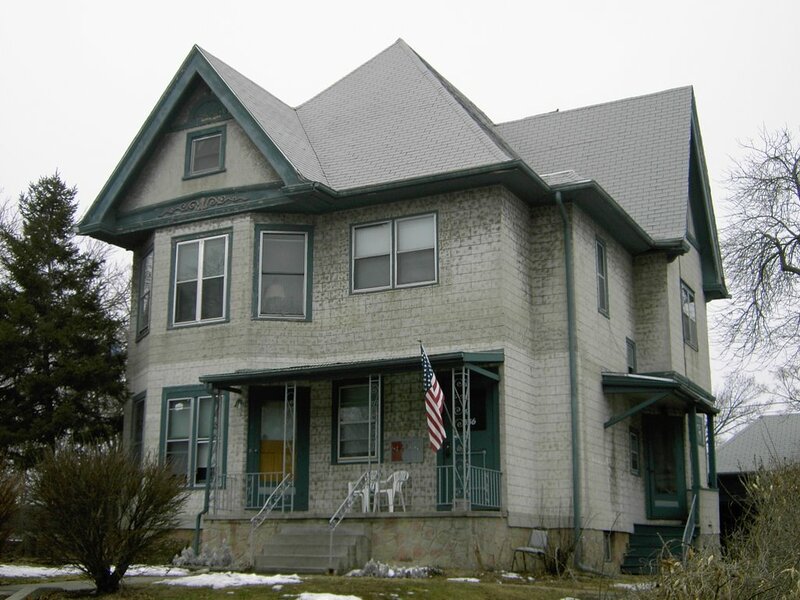 The two houses built by the Mutual Investment Company are desined with the same square footage and off-set door layout by the firm Fowler and Deindorff. These are the only houses on 40th street the firm is credited for designing. 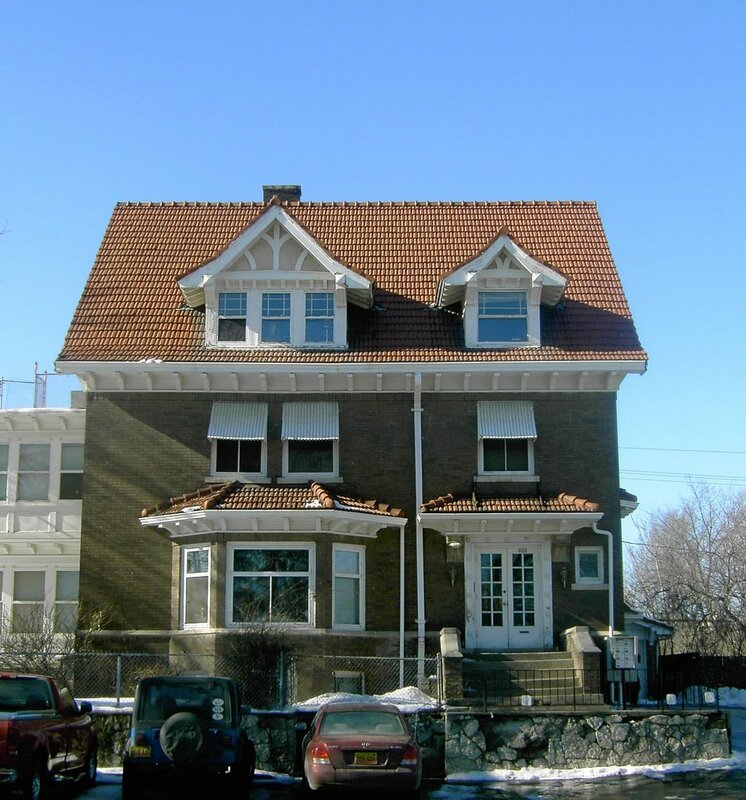 A more well known residence the firm designed one year later was Edgar Zabriski’s Queen Anne style house at 35th and Hawthorne Avenue. Benjamin Fowler and Charles Beindorff were partners for five years and desined many residences, the Merriam Hotel, old City Hall and the Omaha Club. A 1888 Omaha Daily Bee newspaper article featured another building this firm designed called the “Colosseum”. The building was 81,000 square feet and was constructed to hold athletic events as well as huge conventions. It was the largest structure of its kind and none rivaled it except for the Madison Square Gardens in New York City. The building was said to feature a “new architectural tress work” that had never been seen before. 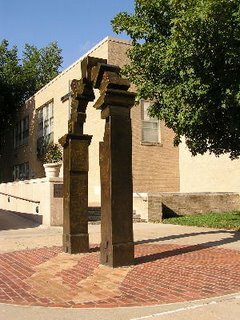 It was located at 20th and Spruce. No one knows what happened to the structure. This family sized house was built about the same time as the Lynhurst (the Joslyn Castle) and designed by the same Architect. McDonald has a successful practice primarily designing houses for wealthy Omaha families. He had this own firm from 1890 to 1915 when his son Alan joined him, and the two of them worked together for another 30 years. In addition to this house and the Joslyn home, McDonald designed the houses at 411 No. 40th, 415 No. 40th, 320 No. 40th and the old Community Playhouse at 302 No. 40th street. He also designed five houses in the West Central-Cathedral Landmark Heritage District (large running along 38th street from Capital Avenue to Cuming Street) and lived in the neighborhood at 515 No. 38th street. 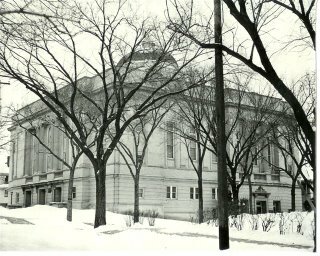 In addition to houses, the McDonald’s designed the First Unitarian Church, Beth El Synagogue, the Hill Hotel and the Joslyn Art Museum. 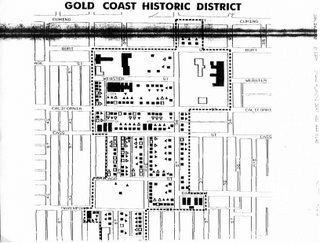 The Gold Coast National Register District included the Carburry Apartments and runs along the east side of 40th street to the St. Cecilia's Catherdral along this portion of the district. 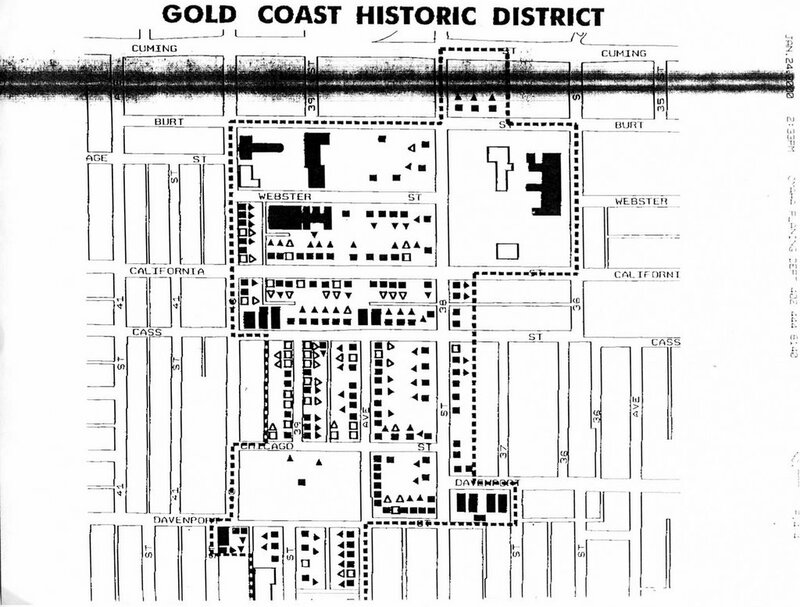 Structures indicated in all black were considered "contributing" to the district based on the criteria at the time. Since this document could be 20 years old and the "non contributing" structures have aged, some of them might be considered "contributing" based on todays historic standards. Not in the official walking tour brochure but I think architecturally significant to mention. There is a cluster of 3 apartment buildings on this lot. This is also the one of the few buildings on 40th Street to be included in the Gold Coast National Register District. Bloggers Notes; Eva Swanson, a resident of the Gifford Park Neighborhood, tell the memory of her uncle riding the street car to attend Easter Sunday lunch at a relatives house. He was a recent arrival to Omaha and the US and was coming from the downtown YMCA. As the street car turned onto 40th Street the weather turned violent. Evenyone jumped off the street car and fled. Not familiar with Nebraska weather he had no idea what was going on. He hugged a nearby tree for his dear life as he watched the roof flight off Saudners Grade School. When the tornado had passed he preceeded to walk to the relative house for Easter Lunch. They were very upset with him arriving late and had no idea what had just happend. These were the days before radio and certianly CNN. Cetainly within a day or two the entire city realized the enormity of destruction caused by the 1913 Easter Sunday Tornado. Like the old saying, "I had to walk to school and it was uphill both ways" could have actually been true if you lived at 40th and Cass. 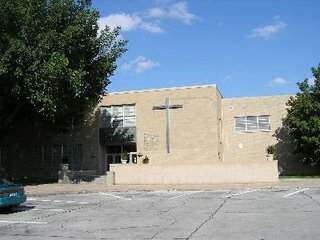 On Cass you walk down a step hill to 41 Street and then back up a steep hill to 41 Avenue, the location of Saunders School. 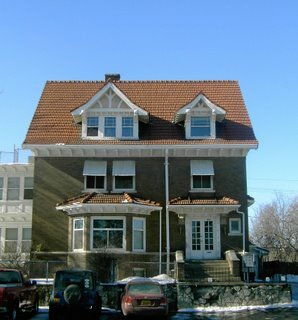 Gustave Epeneter, who built this house, was the owner of the Eagle Cornice Works, which made decorative metal cornices. Epeneter and his wife, Minnie Pearl, livedin this house for several years before building the house next door. Epeneter used materials made by his company everywhere possible in the house. The most distinctive feature of the house’s exterior is the metal trim on the widows walk. There is a galvanized iron balustrade on the top of the roof, and a stamped metal frieze runs along the cornice line. There is a ballroom on the third floor, and oak woodwork is used throughout the interior. Many of the house’s original features are still evident. In 1925 Epeneter was on a jobsite at the old Burgess-Nash building at 16th and Harney, inspecting some work when he slipped off some wet scaffolding and fell 20 feet to his death. His obituary states that in 1921 Mr. Epeneter built a “home on wheels” for himself and his wife to tour the country. He called it “Epp’s Pullman Ford” and it was said to have “all the conviences of a Pullman and more too.” This might be the precursor to the motor homes we see on the road today. The Epeneter's built this house in 1910 and lived here from 1912 until 1924. Annie Elizabeth Rush bough the house in 1924 and lived there with her husband, John Rush, and her daughter, Florence. 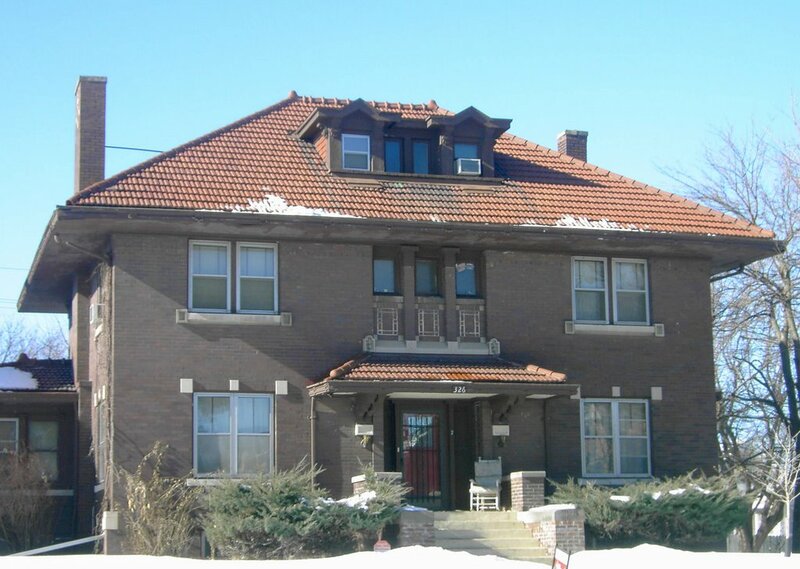 Florence, who was a teacher at South High , and her sister, continued to live in the house after their parents died until 1973, when they sold it and moved across the street to the Cadbury Apartments. The Rush family was one of Omaha's first schoolteachers. He later was elected the county superintendent of schools, was the county treasurer and a national bank examiner. He married Annie Ferry in 1868 and they had 14 children. His wife's father was James Ferry, who was the first contractor in Omaha and is credited with building many of Omaha's early buildings. The Ferry family is noted in a Nebraska History Magazine as having the first white child born in Omaha, Mrs. Rush's sister Margaret, in 1854. Bloggers note: Take a moment to appreciate the very old Elm tree that is going in this home's front yard. This has to be one of the few Elm's to escape the devistating effects of Dutch Elm Disease. Abraham Haykin ran a grocery store at 2806 N. 26th Street before building this new store on 40th Street beginning in 1922. There are two other Haykin's who owned grocery stores in Omaha during the 1920's, and it is speculated that this was a family business. This building was built as a retail grocery on the ground floor with a residence on top. 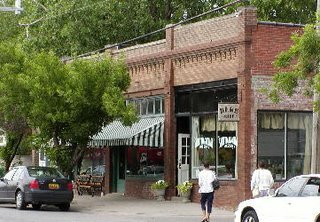 This mixed use of retail and residential was very popular until after World War II. In 1930 Reed Ice Cream Company built a small ice cream "bungalow" next to the grocery story. 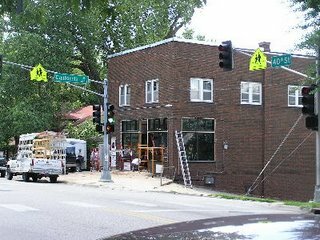 (In later years, the ice cream stand was located one block north at 620 N. 40th Street.) The REed Ice Cream Company sold five cent ice cream cones in white "bungalows" at 63 locations in Omaha from the 1930s through the late 1950's. The company was organized in 1929 by Mr. Claude Reed and the plant was located at 3106 N 24th Street. The company sold ice cream in Omaha and Council Bluffs and, according to an Omaha World Herald article, sold as many as 22,000 cones a day.After he closed the store in 1959, Mr. Reed is credited with inventing a machine that would pressure-whip ice cream or yogurt together with various flavorings. He patented this machine and called it Whirl-a-Whip. Tea Whirl-a-Whip gave birth to what we call Blizzards(C) today. Not much is known about the original owner, LeBrand DeChristian, who owned the house for nine years. A 1912 city directory lists him being involved in real estate. 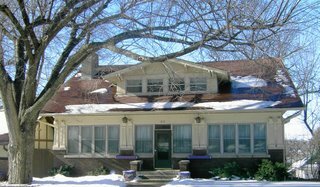 In 1918, Fredrick Henniger designed an addition to the house. Henniger designed office and commercial buildings, as well as many houses in Omaha. He was so prolific and quick at designing he became knowing as “House a Day Henniger”. 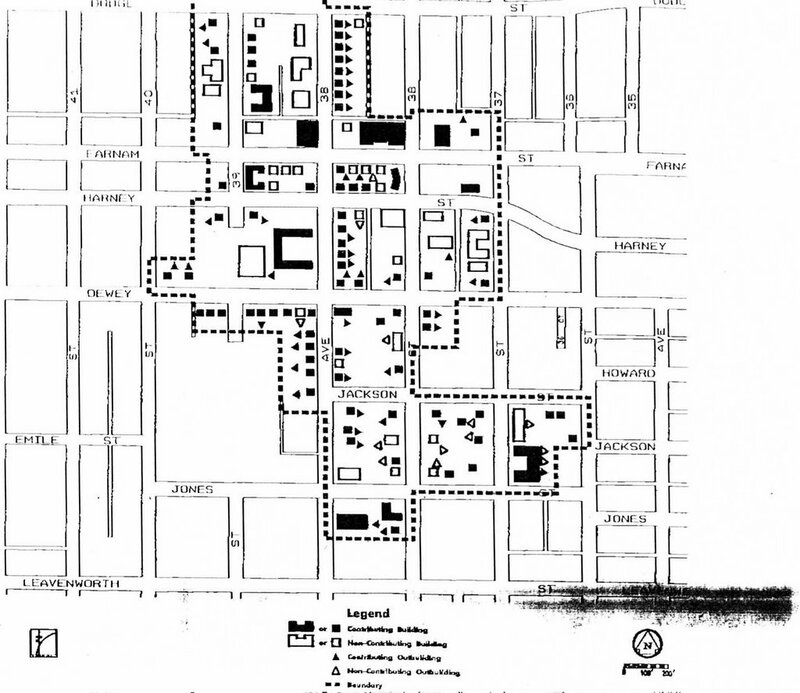 He designed five houses on 40th street and a dozen or more in the immediate area. 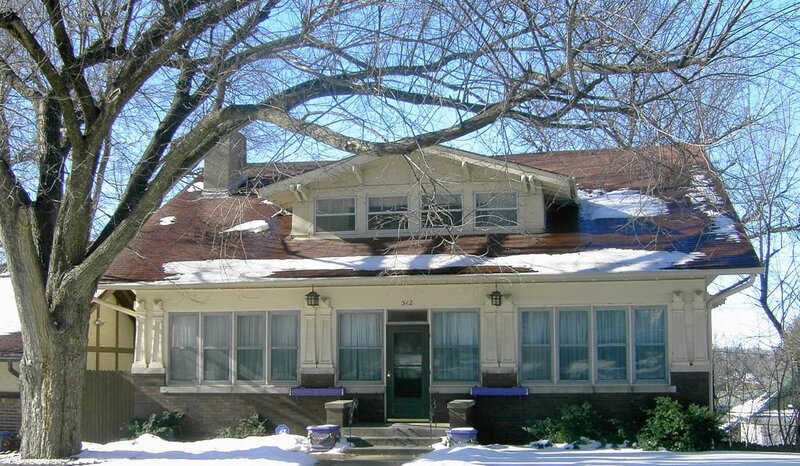 This house and the one next door were built at the same time and are the oldest houses on 40th Street. A.J. Poppleton owned the land when the houses were built. He was listed as a contractor in the Lowe Avenue Building Association in 1887 but would later become involved in a lawsuit against the company. 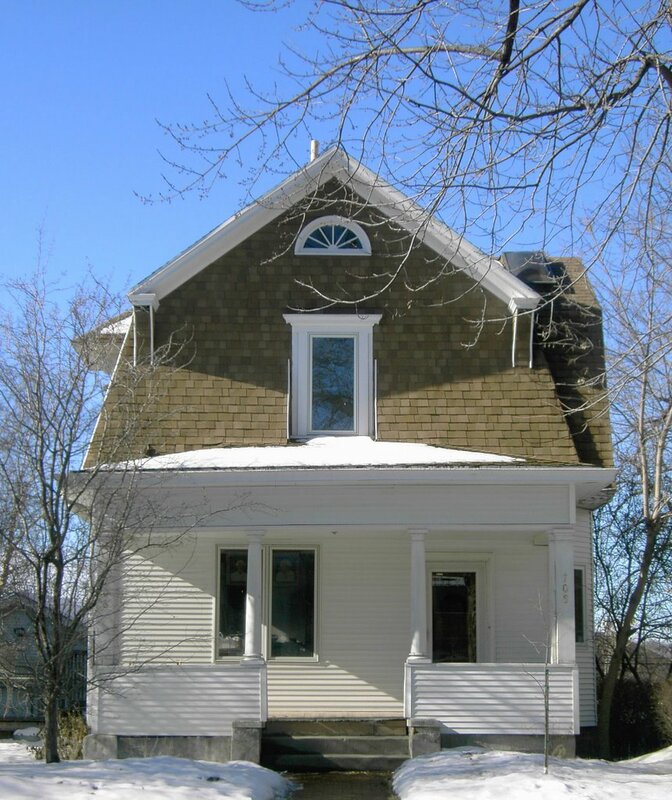 In 1892 the Lowe Ave. Building Association sold the house to Anderson Ong. 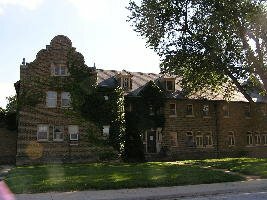 Mr. Ong was the president of the Omaha College of Shorthand and Typewriting, which as re-named the Nebraska College of Business in the early 1900’s. A 1900 phone directory ad states that the college had “equipment in every department unapproached by any school west of Chicago, thus affording young people every advantage to qualify themselves for the duties of life.” The college offered courses of study in bookkeeping, banking, shorthand, typewriting, and English. 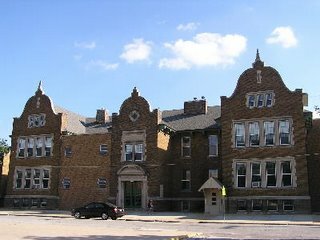 In listing the advantages to attending the school, the ad boasts that the school had the “best lighted rooms in the city of Omaha.” The school was originally located above the Boyd Theater at 15th and Farnam but has had many moes, and for many years maintained a campus at 37th and California Streets. The college is till operating today, but is now called Hamilton College. 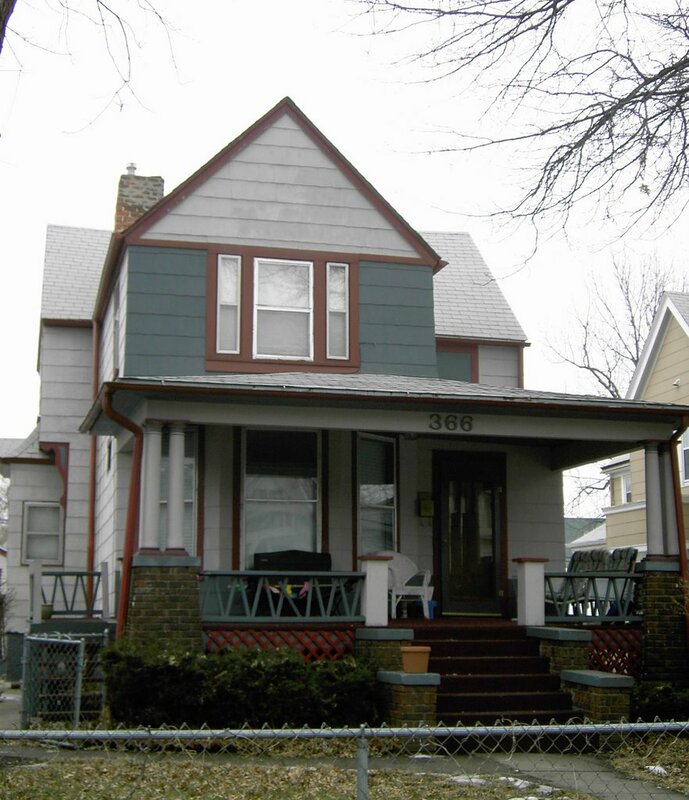 This is the second house built on 40th Street by the Lowe Ave. Building Association. The land was owned by A.J. Poppleton, a prominent person in Omaha’s history. Mr. Poppleton came to Omaha in 1854. Hew was the first practicing attorney in Omaha, participating in creating the first laws of the Nebraska Territory, was a member of the first and second Legislatures, was the second mayor of Omaha (1858-59) and head attorney for the Union Pacific Railroad. 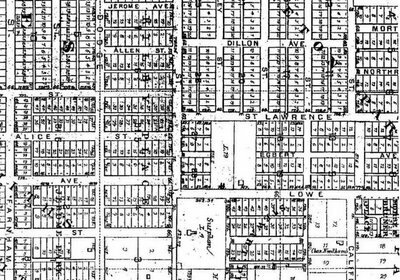 Along with all these jobs, he also invested in Omaha real estate, and much of the land in this part of the neighborhood was owned by Mr. Poppleton, and is still referred to on many deeds as part of Poppleton Park or Poppleton Place subdivision. In 1894, Mr. Poppleton took the Lowe Ave. Building Association to court, complaining that the Association failed to pay for 40 lots in Poppleton Park as set out in April 1887 agreement. The defendants argued that Poppleton overstated the value of the land and that the lots were presented to them as being worth $1,200 each when their true value was $600 each. The district court judge, Edward Duffy, found in favor of Mr. Poppleton and ordered Lowe Avenue Building Association to pay $27,780.37, plus interest – the balance due for the lots. The money was not paid, and after Poppleton’s death his wife and son took Lowe Avenue Building Association back to District Court, suing them for the upaid monies. 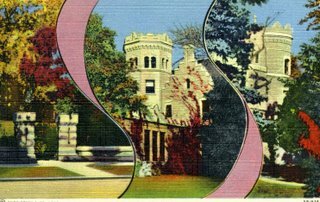 This company was one of many business started in the late 1880’s when Omaha was experiencing a boom and the city boundaries were expanding to the western edge of what is now the Joslyn Castle Neighborhood Association. Thomas Rogers Kimball began the design of this Spanish Resaissance Revival edifice in 1901, sited on land once considered West Omaha and though a poor choice for a new cathedral. The interior accommodates an enormous barrel vaulted ceiling with adorned molded ribs, supported by a series of double arched bays. The impressive eight "singing" stained glass windows in the clerestory and may of those along the ambulatory were created by the Boston artist Charles J. Connick. The central focus of the cathedral is the apse(area of the alter);, with its altar of white Carrara marble and bronze "Christus". The Christ and the bronze Station of the Cross were crafted by Albin Polasek of Czechoslovakia, as well as th six carved mahogany statues of the "doctors of the church" in the pulpit, and five of the relief figures of the apostles in the wall of the sanctuary. The sanctuary wood is oak, and adorned by the Bishop's chair, screen and clerical stalls. Kimball designed the pulpit and confessionals, which were then hand carved in Pietrasanta, Italy. In the Chapel of Our Lady of Nebraska, the stained glass windows were reassembled from a 16th century Spanish church.Kimball died 25 years prior to the consecration of the cathedral (1959), but the finishing details, including the towers, were completed to the very inch that Omaha's most renowned architect had specified. An extremely careful and demanding restoration of the cathedral began in 1997, first with the replacement of the roof's red tiles with tiles of the same era, furthered by the recreation of the original sun-gilded canvas mural of the apse ceiling, and much master stenciling and painting work throughout the church. In 2003, Marin Pasi Organ Builders of Roy, Washington, and Kristian Wegscheider of Dresden, Germany, built a new pipe organ for the cathedral. This resonant instrument sensitively includes the arches and pillars as well as other ornamentation designed by Kimball from the original 1918 organ facade. A new alter made of bronze and incorporating two types of marble, by local sculptor John Laiba was completed in 2005. Supplementary restoration work continues. The old Cathedral High School which now serves as a Museum and Cultural Center for the St. Cecilia's complex. Named after the first Territorial Governor, Francis Burt (1807-1854). Gov. Burt arrived in Bellevue, NE on October 6, 1854. He died a few days later on Oct 18, 1854. These business buildings were built by Sam Mercer in the 1900's. Dr. Mercer was a physician who came to Omaha in 1866 and established a name for himself as a physician, educator and in later years as a business entrepreneur. 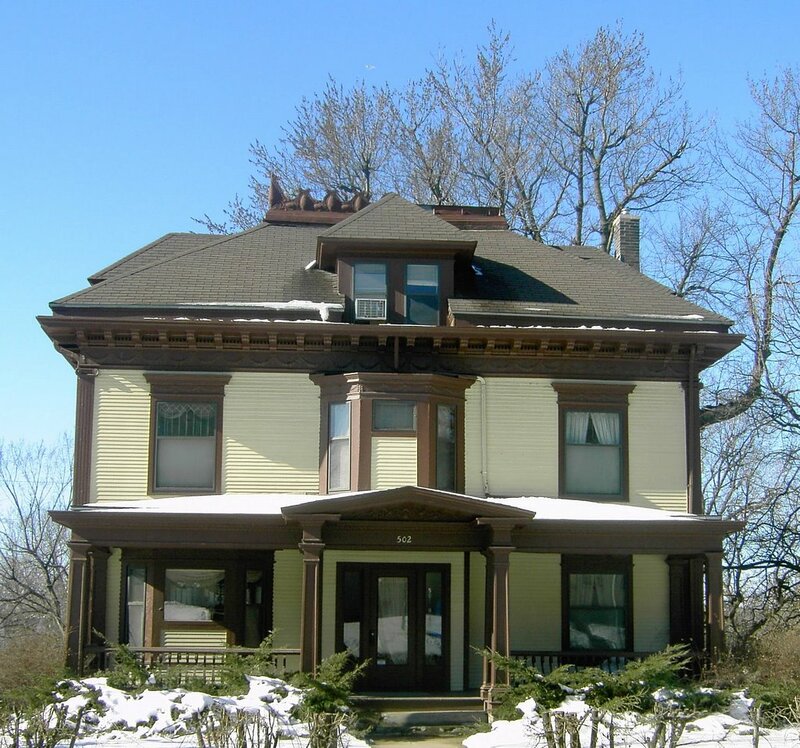 Dr. Mercer had an active medical practice for 20 years, established the first hospital in Omaha (30th & Cass Street), organized and established the Omaha medical College and was a professor of surgery at the University of Nebraska. After he retired from private practice in 1886 he was active in politics and ran unsuccessfully for governor. 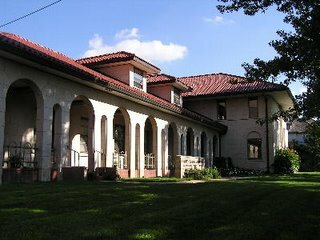 In the late 1880's he purchased a farm on the outskirts of Omaha, established a waterworks reservoir and platted out a subdivision know as Walnut Hill, where he built his mansion. 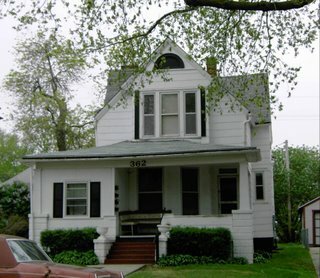 His interest in real estate continued and he built 50 or more businesses located in his neighborhood business district: a hardware store, a drug store, a toy store, a tailor shop, a dressmaker shop, a shoemaker, a plumbing shop, a grocery store, an Omaha Bee office and later an Omaha World Herald distribution center. Today these buildings are occupied by some of the neighborhoods favorite stores the Radial Cafe (oldest operating cafe in Omaha) and Sweet Magnolia's Bakery.